The background of this research ties into a well-known corporate activity: group meetings. I imagine most of us go through the ritual team meetings. Team meetings are good for a lot of things, but innovation may not be their highest and best use. Turns out, research says that companies would be better off if employees had a way of coming up with ideas on their own, not in group meetings. Via MSNBC, the findings as reported in the Journal of Consumer Research. 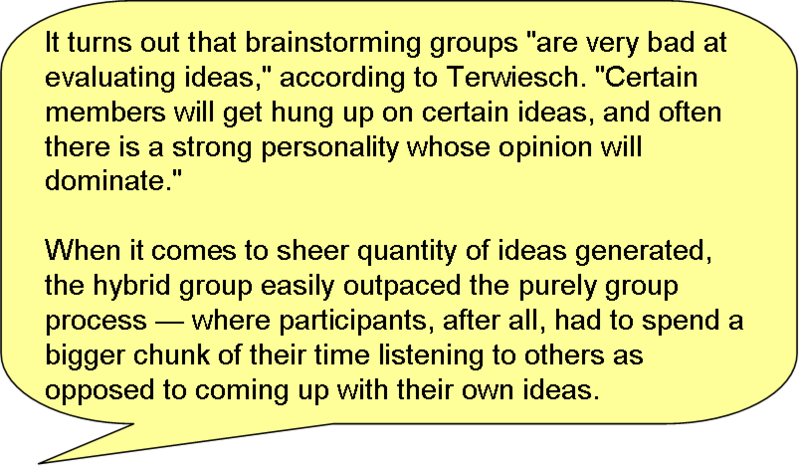 These observations about brainstorming ring true to me. I’ve been in enough meetings to know that strong personalities and prior relationships can hold sway over a group. The quote above by the Indiana University associate professor describes a dynamic I’ve seen time and again. An idea suggested early in the session gets traction, and becomes the focal point of the brainstorming. At some point, groupthink takes over. Maybe it’s exhaustion, maybe it’s an inability to focus on the other ideas anymore. Yes, good ideas can emerge. But often, the whole exercise feels forced, and in my personal experience, employees don’t expect much from these meetings. Particularly if they’re run by outside consultants. The traditional model, assembling a group of people. The other group took a “hybrid” approach, working on ideas by themselves before coming together to share their thinking. A few thoughts from that quote. One, the best idea can emerge from the group brainstorming, but I suspect it takes a truly motivated group. People need to come to meetings energized, ready to participate in a rapid-fire exchange of ideas and counter-arguments. In my experience, most meetings aren’t like that. 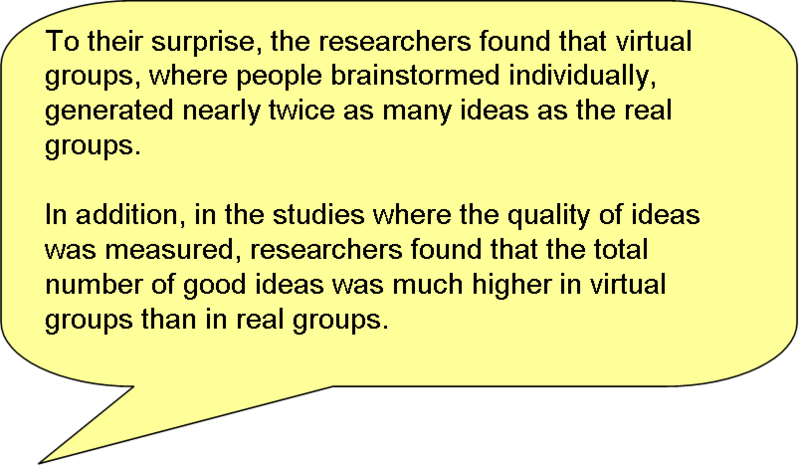 Also, how does that research that both the best and worst ideas emerge from group brainstorming play out there? Who doesn’t want the best ideas to emerge, but are you ready to put up with the worst ones too? Is there an argument for maintaining a larger number of ideas that are consistently above average? Why can’t we get the best of both worlds? I want a higher quantity of good ideas, and I want the best ideas to emerge. While avoiding the worst ideas, if possible. 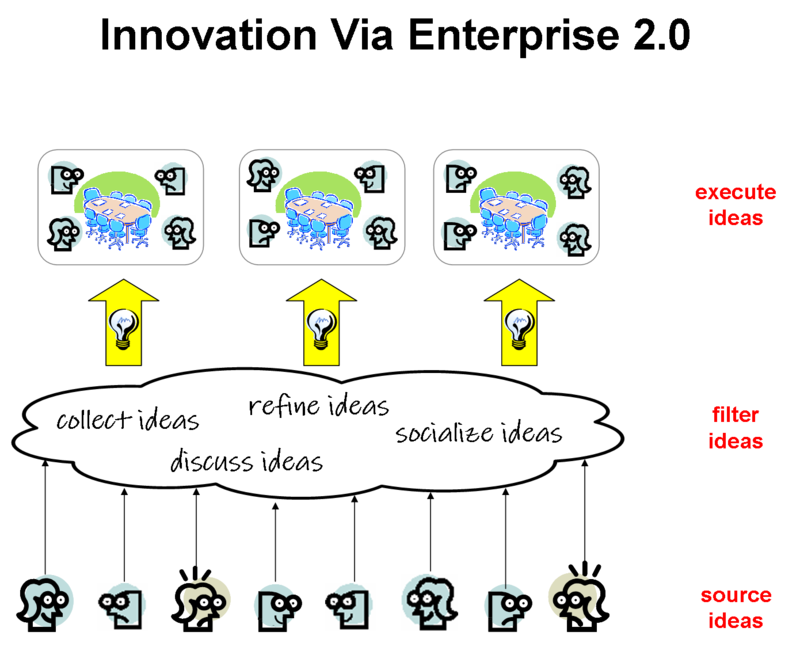 Source Ideas: In the model above, the bottom level speaks to the core driver of Web 2.0: user-generated content. In this case, employee-generated ideas. Applying the familiar design and functionality of the consumer web (e.g. Twitter, Flickr, FriendFeed, WordPress, etc.) allows the easy creation of ideas. Filter Ideas: Something I’ve learned by participating in social media is that your peers are amazing filters. Find a group of people with common interests – but with different opinions – and you’d be amazed at how the most useful stuff floats to the top. Happens in blogging, photos, videos, tweets etc. Execute Ideas: After all this idea creation and filtering is done, the ideas need to be executed. Here’s where the group dynamic becomes a huge plus. Most ideas in a corporate setting will touch a number of areas, and the group makes it happen. The key to getting the best of both worlds – more ideas of better quality, identification of the top ideas – is to create a culture where ideas are rapidly created and evaluated, while also letting advocates gestate their ideas to fix areas of weakness. The ‘Source Ideas’ part of the model speaks to the best of brainstorming as researchers have found, in the above quotes. In my own experience, it’s hard to find those channels for new ideas, either fully baked or based on a hunch. You’d typically have to email someone, or call a meeting with several folks. Coming up with new ideas is challenging enough…you then have to go through workplace Olympics to see an idea get discussed and considered. ‘Filter Ideas’ gets to the heart of what makes group brainstorming powerful, when it works. The rapid creation and analysis of ideas helps everyone. Different points of view, people seeing unique opportunities with an idea or recognizing weaknesses…all are vital to the corporate innovation process. 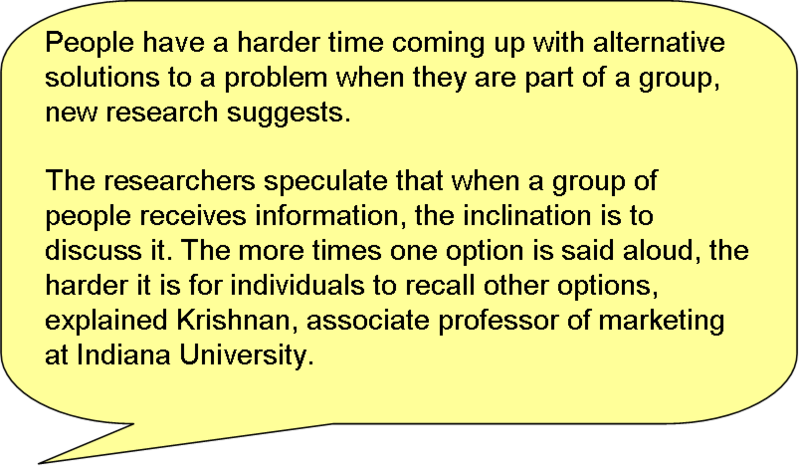 Currently, this can only happen in a group setting, but the group brainstorming dynamics have to be “right”. Enterprise 2.0 has this figured out. Ideas are easily created and shared. Proponents and opponents can develop analyses of ideas. Simple commenting is very powerful, while longer form blogging can lay down foundational elements. Proposed ideas and discussions live longer than the one hour everyone is together in a conference room. I know this, because I see it everyday in places like FriendFeed, blogs and Twitter. The diverse opinions, knowledge, creativity and world views result in some really good ideas and perspectives. I’m not prescribing the particular technology to capture the best of individual and group brainstorming. There are different ways to approach that. What matters is letting the employees try this out for themselves. Groupthink has its place. A unified group taking on the challenges of the market is vital. But groupthink should kick in after the innovation processes have occurred. First, a healthy scrum of ideas, ultimately filtered to the ones that a company will execute. Then everyone working together with a common sense of purpose. A utopian vision? Perhaps. But like all stretch goals…if you get halfway to them, you’ve accomplished a lot.